The Pinnacle Peak real estate area of Scottsdale covers several communities either side of Scottsdale road including Pinnacle Peak Vistas real estate, Canyon Heights real estate, Los Gatos real estate, Los Canyon real estate and Pinnacle Paradise Estates real estate. The best kept secret is Pinnacle Peak Country Club, a distinct golf and Country Club community, featuring an 18 hole traditional style walkable golf course,with tree lined fairways setting it apart from the desert golf courses. Originally opened in 1976 as North Scottsdales first private country club, the 7032 yd par 72 course has a rating of 73.5 and a slope of 136. 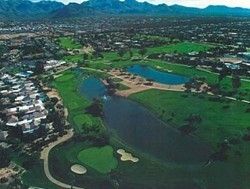 Pinnacle Peak Country Club & Golf Membership is separate from property ownership.